Here are the Brisbane politicians who represent Carindale, Carina and surrounding regions. We invite ALL local representatives to contact us with information relevant and/or important for locals residents, groups and businesses. If you’re a resident with queries/concerns/ideas about issues related to the region, we welcome you to submit your letter to the edit / article to us for publishing on Carindale Connect. The Chandler Ward includes Carindale, Gumdale, Chandler, MacKenzie, Burbank, Rochedale and Carina Heights. It also includes parts of Belmont, Camp Hill, Mansfield and Mt Gravatt East. The Doboy Ward includes the suburbs of Carina, Hemmant, Murarrie, Ransome, Tingalpa, Wakerley and large parts of Belmont, Cannon Hill and Manly West. The Morningside Ward includes the suburbs of Balmoral, Bulimba, Hawthorne, Morningside, Norman Park, Seven Hills and parts of Camp Hill and Cannon Hill. Holland Park Ward covers Holland Park, Holland Park West, Mt Gravatt, Mt Gravatt East and Tarragindi. The Coorparoo Ward includes Coorparoo, Greenslopes, part of Annerley, part of Camp Hill and Carina Heights. Key sites include Whites Hill Reserve, Ekibin Park and the Stones Corner retail and hospitality precinct. The electorate of Chatsworth includes Tingalpa, Gumdale, Belmont, Carindale, Carina Heights and parts of Carina. The electorate of Greenslopes includes Holland Park and Holland Park West, and a large part of Coorparoo, Camp Hill, Mt Gravatt, Mt Gravatt East and Greenslopes, and a small part of Carina Heights and Norman Park. The electorate of Bulimba covers the inner eastern suburbs of Brisbane. It is bounded on the north and the west by the Brisbane River and, as at the 2009 election, covers the suburbs of Bulimba, Balmoral, Cannon Hill, Hawthorne, Morningside, Norman Park, Murrarie and Seven Hills. The electorate of Mansfield includes the suburbs of Mansfield, Upper Mt Gravatt, Mackenzie, Burbank, Rochedale, Wishart and parts of Mt Gravatt. The Bonner electorate includes the area between Creek Road, the South East Freeway, Moreton Bay and the eastern boundary of Brisbane City Council. From north to south it includes the Port of Brisbane, Wynnum, Manly, Lota, Tingalpa, Belmont, Carindale, Mansfield, Mount Gravatt, Wishart and Rochedale. 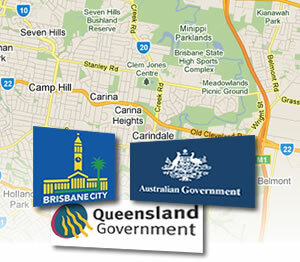 The seat of Griffith includes Balmoral, Bulimba, Camp Hill, Carina Heights, Coorparoo, Dutton Park, East Brisbane, Greenslopes, Highgate Hill, Hawthorne, Kangaroo Point, Morningside, Norman Park, Seven Hills, South Brisbane, and Woolloongabba, and parts of Annerley, Cannon Hill, Carina, Holland Park, Holland Park West, Mount Gravatt East, Murarrie, Tarragindi, and West End. Please note that the “Homepage” link for Kevin Rudd is not correct. It goes to the Home Page of Bob Carr, Foreign Minister.This was KRudd’s page in the good old days but is no longer his portfolio. Can someone please correct this link? Ah yes, that link is now the up-to-date one. Thanks Tony!